Do you have an upcoming community event? Maybe you run a local charity, cultural group or training course and would like to get the word out to the wider Wellington community? All displays must meet our Display Policy. To complete a booking, fill out the application form below. With this you agree to the Wellington City Libraries' Display Policy. You can either drop your completed form in to the Information Desk at the Central Library, or scan your completed form and email it to our Central Library Displays Team. If the time period you're interested in is not available, we will let you know what dates are still available. Payment is non-refundable and date changes can only be made if there is space available. You are welcome to set up your display from 9.30am onwards - this is when the Central Library opens (Monday-Saturday). 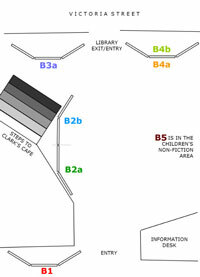 Please let the Information Desk know you are here and check the location of your Display Board. Have questions? Need more information? Phone 04 801 4060 or email email the Displays Team for further information. In addition to the bookable display boards at Central, all library branches provide free public notice boards and leaflet stands for displaying and promoting the activities and programmes of community organisations and groups.